In 2016 Denver will see more bike lanes, bike-friendly intersections, and neighborhood streets that prioritize people on bikes, according to reps from Denver Public Works, BikeDenver, and the Downtown Denver Partnership. The advocates and bike planners spoke to about 100 people Tuesday morning at the Denver State of Biking 2016 event, briefing the public on upcoming projects and the cultural shift they hope to achieve. 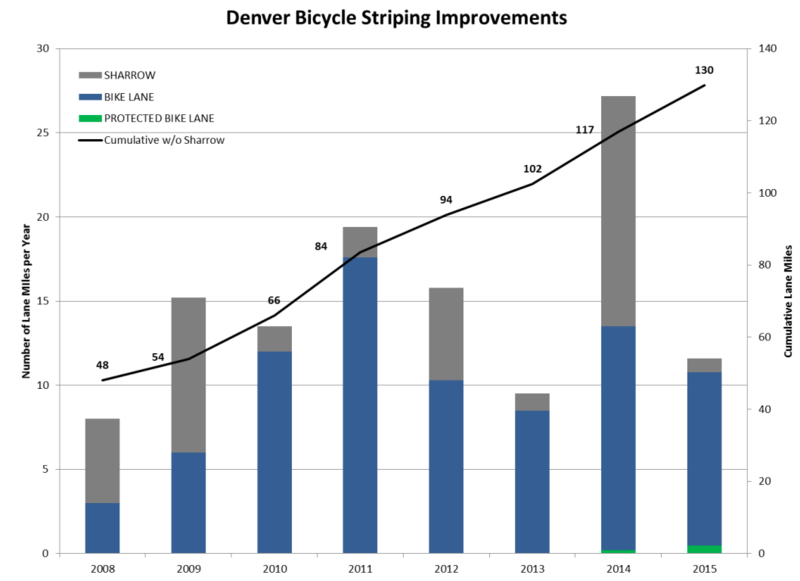 All in all, this year looks to be a big one for biking in the Mile High City. Here’s what to expect. Denver Public Works now has a crew solely for biking and walking infrastructure, and it will install 18 miles of bike lanes citywide. Of those projects, two or three will be protected bike lanes. Look for protected lanes on Stout Street (19th to Downing), 14th Street (Market to Colfax) and 14th Avenue (Speer to Bannock). “We are focused on shifting our infrastructure efforts towards those low-stress, high ease of use facilities,” said Emily Snyder, Denver’s Urban Mobility Manager. Anyone who uses the 15th Street protected bike lane — Denver’s first — knows the feeling of getting pushed back into traffic whenever a driver decides to park in it. It’s easy for drivers to occupy the lane because a porous row of plastic sticks is all that separates the bike lane from traffic. They’re flimsy and need to be replaced yearly. DPW will test three more substantive separators this year: planters, concrete barriers (think a jersey barrier but prettier), and a pre-cast curb. “The experiment will help us understand operationally, maintenance-wise, and public perception-wise what works best,” said DPW Bicycle Planner Rachael Bronson. DPW will also begin studying the abrupt end of the 15th Street bike lane at Larimer Street in hopes of connecting it all the way to the Highlands. A Solution to Keep Cars Out of Bike Lanes? It’s well documented. BikeDenver Executive Director Molly North said drivers parking in bike lanes is the advocacy group’s top concern based on member feedback. Will this be the year that something changes — with better enforcement and physical engineering that stops drivers from forcing people on bikes into speeding traffic? DPW plans to finish one or two neighborhood bikeways — streets with traffic-calming measures that prioritize people walking and biking. The department will also add bicycle detection to five intersections, so signals will be activated if a cyclist is present but not a car. It won’t be the Eco-TOTEM made famous in Copenhagen and copied in Boulder, but the Downtown Denver Partnership will install two digital bike counters in the pavement along the Arapahoe and Lawrence street protected bike lanes. Leading bike-friendly cities use the counters as a visual to encourage biking and as tool to collect data. The public will be able to monitor the numbers online, though not in real time. DPW tries to plow bike lanes twice a day, Bronson said, but crews were using leftover equipment that kept breaking. The city will buy a plow specifically for bike lanes. Good news about the sharrows–good riddance. 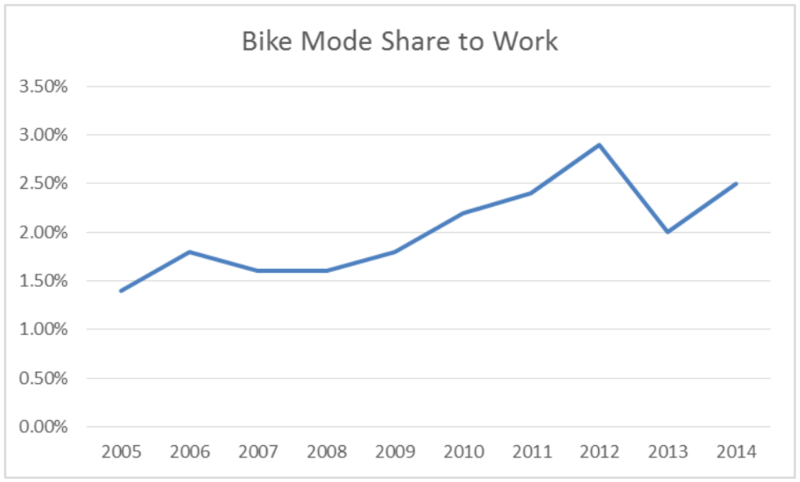 Which neighborhood bikeways will be completed this year? I know Garfield through Congress Park and Cherry Creek. I dunno the other one. DPW is aiming to finish the Knox Court and West 35th Avenue neighborhood bikeways. Glad to hear about the new plowing equipment, 11th has been a disaster. One of the plowing problems not mentioned is private snow removal companies shoveling business sidewalks off into the bike lanes. The lanes are plowed perfectly in the morning after a storm, and by the evening commute they’re full of packed, frozen shoveled snow–not helpful.